Today, please welcome Atul Anand with our second car from India for Ys on Parade with YT 2548. Today, please welcome Tony Bushell with an entry for Ys on Parade of his chassis from YT 3480, and Graham Charles with YB 0314. Andrew Piers has sent in a new picture of YT 2738 for Ys on Parade following it's re-upholstery. The Reprinted Article is the third of three from MG Enthusiast Magazine, entitled "California Dreaming". Finally on this news update, Willem van der Veer has provided a review of the children's book with a Y Type on the cover, "met de kameleon vooruit". Roy Clapham has updated his entry on Ys on Parade for Y 5986. On September 22 this year, we added our first (of many - hopefully) video clips Ys on Film. Negotiations are currently proceeding with MGM for the use of extracts from Evelyn (shown last week on WE network in the US, and yes I did watch it again for the Y Type clip!!) and Dance with a Stranger - so watch this space. However, taking our venture into a full multi-media Y-Type experience for you, one of the first links on our website for Other Websites and Personal Homepages was a link to singer-songwriter and musician annA rydeR wrote a song featuring, among others, a Y Type - well two Y Types actually. Ys on Film has now been renamed more appropriately Ys on Film, and other media. Please click here for more details including full lyrics and a private exclusive recording for the MG Y Register of her song "Put another car in my graveyard". 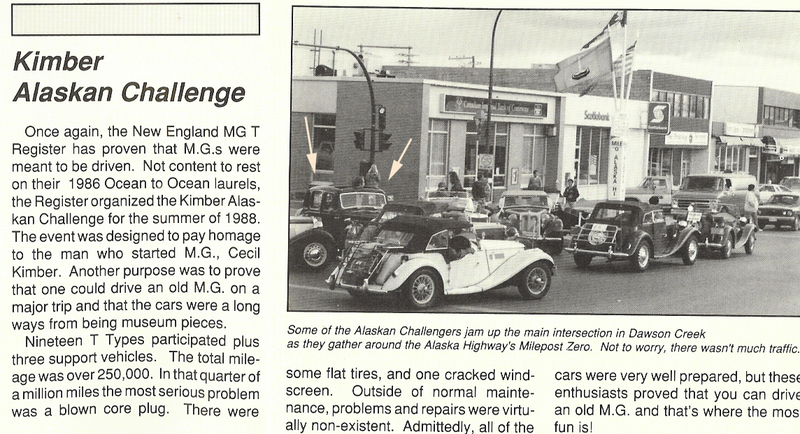 While I was flicking through some more old magazines I came across this small article in MG Magazine 29 from about 1988 and noticed in the background a Y Type - is this from New England, or a local Alaskan car any one know please, and if so who does it belong to now? With the holiday season nearly upon us, Alan Taylor has sent me a water colour and reminded me that he will be happy to take commissions from Y owners for water colours of their Y Types at small fees. Click here to go to Alan's entry in Artist's Impressions. Willem van der Veer has alerted us of a children's book with an MG Y Type on the front cover. This has been added to the Collectibles page. Some users have recently begun reporting problems with their browser reading this page. This is a problem that is restricted to users of Mozilla or Firefox browsers. I have now corrected the errant piece of code that affected both the November 2006 page and the October 2006 page. If you still "appear" to have the problem, you will need to reload the current frame (right click and then either REFRESH [for Internet Explorer browsers] or THIS FRAME then RELOAD FRAME [for Mozilla or Firefox browsers]. Please welcome Matt Sanders with Y 7223 and YB 1503 to Ys on Parade. Matt is also the proud new owner of Y 0485 too. Rob Dunsterville has sent in some new supplier links for Australia which have been added to the Links page too. Please welcome Dren and Di Errington with Y 5903 to Ys on Parade. Dren's car also does the occasional wedding too. This month we bring you another Reprinted Article from the Diamond Jubilee of the Y Type, 1997. This is second of three articles from the July 1997 edition of MG Enthusiast and is called "Building the Y Type". If this appeals to you, you will also enjoy the publication "Enjoying the MG Y Type" which has a much fuller article on the construction method. Peter Sharp recently visited the British Motor Industry Heritage Trust at Gaydon, Warwickshire, UK. While he was there, he took the opportunity to ask and take several photographs of Len Shaw's MG YB. Peter sent them into us and we have added Len's car to Interesting Ys. There is a new Picture of the Month which celebrates the international nature and friendship of Y ownership from earlier in the year when Tim Tavani visited with Alf Luckman and Peter Fogarty. Stephen Webb is seeking information on the whereabouts of his old YA - licence plate MG 7401. Please see Lost Ys. For Y owners in the Pacific North West USA and Canada BC, there will be a Y Birthday weekend 11 - 13 May 2007, the same weekend as the UK gathering and will take place in the Bellingham WA area. We are already up to five cars so if you are interested in this event please email Paul Barrow. Further details will be released as they become available on the Events page.